IEEE has partnered with SAE International to deliver a core collection of highly valuable and relevant eBooks to the IEEE Xplore digital library. 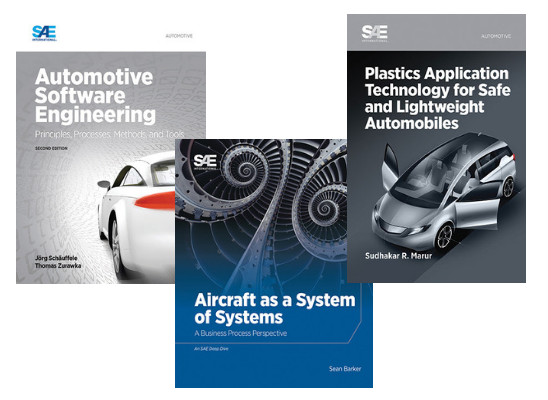 The SAE eBooks Library explores topics critical to aerospace, automotive and ground vehicle engineering. Known as an authoritative resource by top engineering companies and universities around the world, SAE International specializes in transport industries, and the titles in the collection comprise the latest, most respected information source in the industry. Fill out the form to connect with an IEEE Sales Representative and request your free trial. Established in 1905, SAE International is best known in the United States for its ratings of automobile horsepower and setting the standards (SAE J300) for the performance of motor oil viscosity. Known as an authoritative resource by top engineering companies and universities around the world, SAE International is a global association of more than 128,000 engineers and related technical experts specializing in transport industries such as automotive, aerospace, and commercial vehicles. Please note: Territory restrictions apply in certain markets. Please contact your IEEE Account Manager for further details.